Whatever line there was between playing Rock Band as a game and playing Rock Band as musical instruments has now more or less evaporated with the release of Rock Band 3. Yes, there’s a keyboard, and yes, you can add a strap to it, if that makes it a keytar for you. But there’s more to it than that. For the gaming world’s take on the ratcheted-up difficulty and actual music making functionality, Joystiq interviews Daniel Sussman at Harmonix. The keyboard parts are real keyboard parts. The only difference between Rock Band / Guitar Hero parts and traditional score notation, aside from rotating the whole score 90 degrees counter-clockwise and having it come toward you, is that you don’t get a full range of notes. The keyboard changes that – while not as extreme as my faux mock-up in May, you do get the full range of black and white keys. There’s actually an octave and a half up on the screen, and two octaves on the controller. In other words, while you’re not quite learning to sightread, you are learning actual keyboard skills. There’s also a touch strip on the neck of the instrument, in a nod to keyboard history. MIDI output. 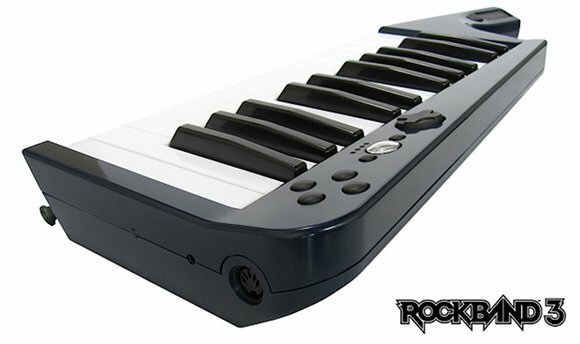 The keyboard accessory supports MIDI output, as confirmed in the Joystiq interview. 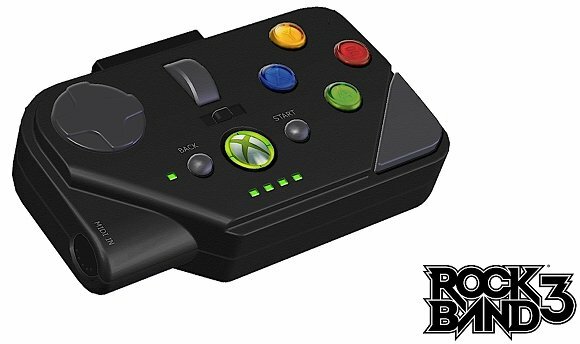 So you can plug the keyboard into your computer – good fun for Xbox-using electronic music geeks, and also a nice bridge for people new to music who want to get into production after using Rock Band. Guitar with strings and frets. This is a bit more elaborate, so it tops my questions for Harmonix when I talk to them, but suffice to say Harmonix is finally adding strings and frets to a six-string model made by Fender. Consider this a teaser, as I’ll be talking to Harmonix later this month. But why does this matter? MIDI in, baby. Now you can play Rock Band with some insane homebrewed controller, if you like – or your Nord Piano. The upcoming RB3 adapter. It makes gaming even more of a gateway drug for music. CDM’s own Jaymis, known better on the visual side of things than music, has started playing drum kit after getting hooked on Rock Band. And statistics worldwide show uptick in interest in buying and playing instruments, even as music education has been under economic pressures. At some point, there may have been a debate about the validity of music games. It’s tough to continue that debate now: games get more people into music, period. And while the games aren’t exactly creative or improvisational, they introduce people to more communal, more musical experiences in surprising numbers. It makes a game musicians might actually want to play. Here’s where I think there might be a surprise. Lots of tech-loving musicians and producers are avid game system owners, but it’s hard not to feel a little silly picking up anything but the mic on the music games. Oddly, RB3 could bridge the opposite direction. Got questions for Harmonix? Stuff you’d like to see? Want to register for my Bring Back Frequency campaign? Let us know in comments.